(KIA)(POW) 28 September 1944 mission #248 to Magdeburg, Germany. One of eleven 303rd BG(H) B-17s lost on this mission. 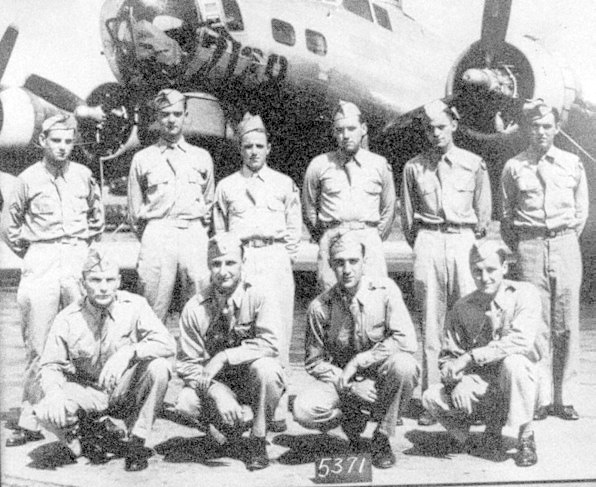 Glasgow crew was flying in B-17G #44-8335 (no name) (427BS) GN-L on their fourth combat mission. Flew on September 1944 missions #243, 244, 247 and 248. Their B-17 was flying in the Lead Group, 4th flight. The 303rd BG(H) formation was attacked by 40 FW-190 and ME-109 German fighters. #44-8335 was hit in the radio room and at its #1 and #2 engines. An explosion, followed by a fire, was seen in the radio room. It peeled off to the left, under control, on fire. Two parachutes were observed. Five pieces of the exploded B-17 crashed near Heerte/ Salzgitter, south of Brunswick, Germany. Lt Charles C. "Glenn" Glasgow (P) was a West Point Graduate. He was thrown from his B-17 when it exploded, managed to parachute safely, was captured and placed in POW Camp Stalag Luft 1. Lt George H. Ashford (CP) was killed when he was out of his seat ordering the crew to bail out. In 1948 a mass grave of 35 Russians were discovered in a woods near Heerter Holz SSE of Heerte, approximately 20 km SSW of Brunswick). A hollow in the ground near the mass Russian grave proved to be another grave in which an American body was found. The USA Graves Team then discovered seven additional remains of #44-8335 Glasgow crewmen. They were temporarily buried at Nueville and later in European Cemeteries or returned to the USA. Sgt's Lisabeth and Britz are now buried in the Ardennes American Cemetery near Liege, Belgium. 2Lt Goff is buried in the Netherlands American Cemetery at Margraten, Netherlands.